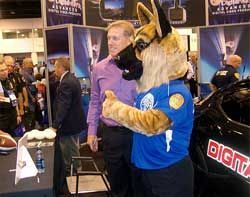 Hundreds gathered around Digital Ally's Booth at the 116th International Association of Chiefs of Police (IACP) Conference in Denver last Monday in the hopes of meeting John Elway. Visitors ranging from Colby the Crime Dog to Miss Montana waited in line for autographs and pictures while others crowded around just for the chance to snap a shot of the Hall of Fame legend. PoliceOne’s video crew and a local Denver radio station also stopped by to interview Digital Ally and catch some of the action. The line wound around and away from Digital Ally’s booth well before and after the time Mr. Elway was scheduled to greet guests. “Look at the line!” exclaimed one approaching visitor. “He’s an important man!” replied his companion. Digital Ally, Inc., which develops, manufactures and markets advanced video surveillance products for law enforcement, homeland security and commercial security applications, supplied custom-designed graphical 8x10s and miniature footballs for the event. Their booth was lined with active DVM series in-car video systems, the DVF-500 digital video flashlight, and even a Harley motorcycle mounted with their modular, all-weather DV-500 Ultra video system for visitors to enjoy experimenting with as they waited. Representatives of the company also circulated with their new FirstVu wearable video system, which was especially popular. John Elway was elected on the initial ballot to the Pro Football Hall of Fame during his first year of eligibility in 2004. His legend aggregated over sixteen amazing seasons with the Denver Broncos – 234 games that included a NFL-record 148 wins. He will forever be remembered for his 47 game-winning or game-tying drives in the fourth quarter (another NFL record), his spectacular passing statistics, and his enduring competitive spirit, which led him to the ultimate professional and personal triumph as starting quarterback in five Super Bowl contests (another NFL record) and winner of two Super Bowls. John Elway ranks second to only Dan Marino in passing yardage, attempts, completions and 3,000-yard seasons.